Ladies, welcome to the 70s. If fashion week was anything to go by then it is safe to say that the 70s are back with a vengeance. 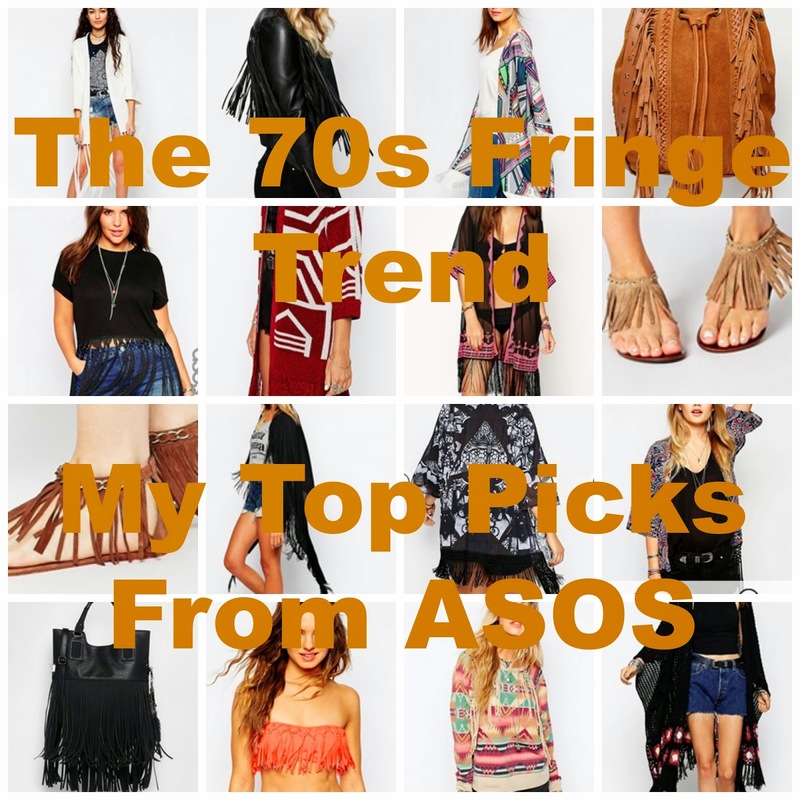 There’s a modern twist on this old trend and the shops already have some amazing 70s inspired clothing in stock. The particular trend that I’m loving is fringing which has really taken me by surprise because in previous years, I haven’t really invested in the fringe trend at all! I used to think it was pretty ugly and undone but now I’m seeing it as more of a laid back, boho chic. I’m not on a spending ban as such but I’m really trying to cut back on the pieces that I’m buying just for the sake of it and focus on investing in pieces that are missing from my collection at a time that I need them. I don’t have any fringing in my wardrobe at all and I’m thinking that it would be great to add some pieces in there for when I go on holiday in a few months time. I’ve been scouring the internet and have found that ASOS have the most amazing selection of fringe detail clothing, footwear and accessories that I’ve seen online so far. I am particularly lusting after these fringe sandals. They just look so effortlessly laid back and would be perfect for a festival. When I think of fringing, I think of it in this tan colour. Its just a shame that theres hardly any sizes left so I’m really hoping that ASOS restock these, if they don’t its an absolute joke, given that its only March! These hippy style light tan sandals are a good alternative though. I’m a fan of wearing shoes and bags that compliment one another so I would definitely pair a fringe bag with some fringe sandals with a relatively plain outfit. A bag is an investment piece for me and I’m always looking for high quality and practically when I’m searching for a new one to add to my stash. While this Maison Scotch fringe bucket bag is absolutely stunning, I just can’t keep my eyes off this black fringe tote because it looks stylish and smart and while I usually think of fringe details as being casual, I feel as though I could wear this bag with a slightly dressier outfit during the day. I’m so surprised with how many black pieces I’m loving as I’m usually into my lighter colours and tan, especially when fringe details are involved. I can’t get over how effortlessly cool this ASOS Curve fringe top is. I’m almost tempted to break my wannabe spending ban over it! The easiest way to wear the fringe trend this spring and summer is undoubtedly with a fringe cardigan or kimono, the latter tending to be lighter in material and weight. Fringe kimonos like this colourful printed one and this monochrome beauty are ideal for hot summer days and holidays as you can throw them on over a bathing suit or bikini and look so effortlessly stylish. There is a limited selection on the ASOS site at the moment and many look as they could be on sale from a previous season so a great opportunity to grab a bargain whereas if you’re looking for a fringe cardigan then you’re really spoilt for choice. I absolutely adore the look of this black kimono with flower detailing. It has this gorgeous crotchet hand made look to it with beautiful fringing. I also love this red kimono; the pattern is so bold and it would look awesome with a cream cami and some light wash denim shorts. The great thing about kimonos is that they tend to be oversized so even if the one that you love the look of isn’t available in your size then I’d suggest giving it a try anyway and you might surprise yourself. Theres so many times I’ve put a kimono, cape or open cardigan on that shouldn’t fit me but it does, with extra room too. Go for it girls, it doesn’t matter what size is in the label as long as you love the way you look. What are your favourite fringe fashion pieces right now? This fringe thing has been everywhere. I wouldn't mind a bag with fringing on though. I usually don't like fringe but the fringe sandals look so cute and elegant at the same time. Definitely on my shopping list for spring :DD!!! That black bag is really pretty. I'm going to have to be careful reading your blog while I'm on maternity leave, lots of pretty things and my budget limited! I actually don't like this new tassle trend. I just can't see the appeal?